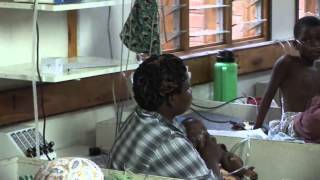 The Pumani is a low-cost bubble CPAP respiratory device for newborns and children. The Pumani bCPAP device is capable of delivering flow from 0 to 10 L/min and pressure from 5-8 cm H2O. Adjusting these settings is as easy as turning a knob or filling a water bottle. The device also has the ability to blend room air with oxygen from a concentrator or oxygen tank. The Pumani bCPAP is designed to run for years at a time and it includes spare parts and a repair manual. The only moving components are small diaphragms that cost less than $1 to replace and are included with the Pumani. A new user can be trained to operate the Pumani in less than one day, and a user manual and repair manual are included with the system. The Pumani provides the same therapeutic pressure as more complicated, gold-standard bCPAP devices in the United States. The Pumani consists of a flow source, a pressure source, and patient tubing. The flow comes from an air pump, and the pressure is provided by a water bottle. Affordable – The Pumani bCPAP costs approximately 1/15th price of other bubble CPAP devices. Simple – The Pumani consists of a flow source, a pressure source, and patient tubing. The flow comes from an air pump and the pressure is provided by a water bottle. Durable – The Pumani is designed to run for years at a time and includes a spare parts kit for simple, annual maintenance. Adjustable – The Pumani is capable of delivering flow from 5 to 10 L/min and pressure from 5-8cm H20. Adjusting these settings is as easy as turning a knob or filling a water bottle. The device also has the ability to blend room air with oxygen from a concentrator or oxygen tank. Effective – The Pumani bCPAP provides the same therapeutic pressure as much more expensive systems in the United States. User-Friendly – Clear labels on the front panel of the Pumani allow for simple use. 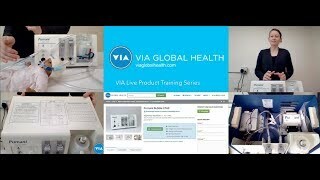 A new user can be trained to operate the Pumani in less than a day, and a user manual and training videos are included. Does the Pumani bCPAP require a separate compressed air source or O2 blender? No, the Pumani bCPAP has an air pump that provides pressure from room air, and the ability to blend room air with oxygen from a concentrator or oxygen tank. What are the power requirments for the Pumani bCPAP? The device requires 220v power. The system has no battery back up and needs to be run with UPC for continuous usage in settings without intermittent power.